I’m sure there are plenty of craft blogs out there and I have no intention of turning this into another one. However, at the risk of confusing everyone who arrived at this blog having Googled ‘how to fit campervan cabinets’ (and alienating everyone else) I am going to indulge in one final post about my affiliation with gingham fabric. A few weeks ago, I bought some beautiful red gingham material, which would be perfect for the quintessential campervan curtain. Since then, I have been looking, unsuccessfully, for some upholstery fabric to match. The stripy fabric that Paul’s so keen to use for the seat covers would clash horribly. Plain red fabric would work well with the gingham, but next to all the red cupboards might create an ambience more ‘brothelesque’ than would be desireable. So I have reluctantly admitted defeat. There will be no gingham in this campervan. We have bought the bright stripy fabric for the seats and I am now on the search for a plainer fabric for the curtains. So this picture is a double-edged sword. On one hand, it means I finally managed to thread the bobbin on my new sewing machine and produce something resembling a tissue case. Hurrah! 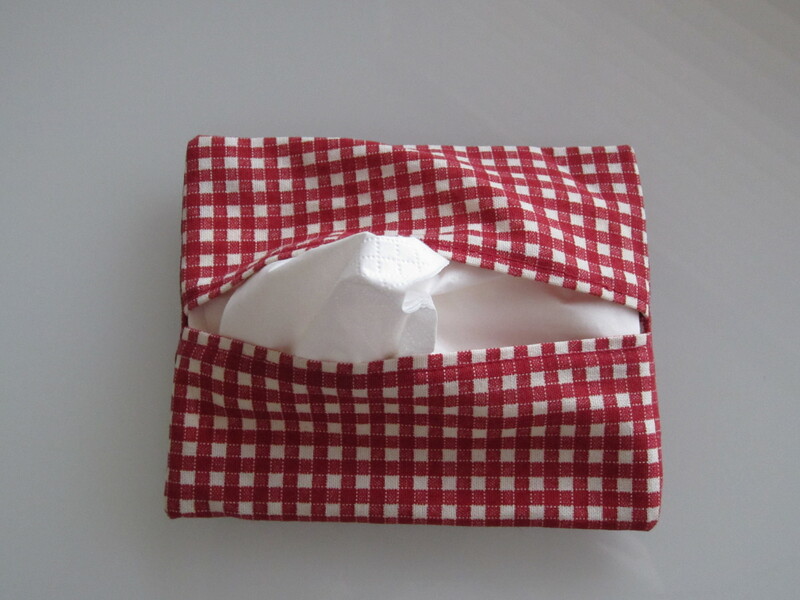 On the other hand, it means that my beautiful gingham, which had so much potential, is destined to spend the remainder of its days protecting packs of Kleenex. So put your orders in now while my bobbin is still in place. I have samples of gingham fabric in red, lilac, navy, black and lime green. How I ever thought lime green curtains would match red cupboards, I’m not sure. This entry was posted in Building a diy campervan, Campervan life, Sewing adventures and tagged campervan cabinets, Campervan conversion project, campervan curtains, campervan upholstery fabric, Converting a campervan step-by-step, DIY campervan, gingham, sewing machine, tissue cases by Rach. Bookmark the permalink.